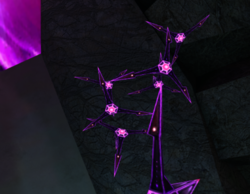 Nightbarbs are small darklings encountered in Metroid Prime 2: Echoes and Metroid Prime 3: Corruption. They are small, black and violet creatures with three barb-like wings. In Echoes, Nightbarbs appear on Dark Aether in the Dark Agon Wastes and the Sky Temple. They travel in huge swarms to protect themselves from their main predators, the Hunter Ing. Nightbarbs appear to be the Dark Aether counterpart of Sandbats. In Metroid Prime 3: Corruption the Nightbarbs are no longer darklings, but are more aggressive and will charge into Samus. There is another species called the Phazon Nightbarb that poses more of a threat, as they have a set of Phazon-based attacks. Nightbarbs are small airborne darklings. Smaller and weaker than a Hunter Ing, a Nightbarb will travel with a large pack to increase its odds of survival. This is wise, since their primary predators are Hunter Ing. Nightbarbs are predators, traveling in packs to search for prey. They have the ability to generate a protective field of energy around their bodies. The ability is unstable, however. If the field makes contact with another life force, it will overload. This also consumes the life force of the Nightbarb, much like a bee's sting ends its life. This page was last edited on 31 July 2013, at 05:28.